Kimchi Fried Rice ( bokkeumbap) is quick and cheap to make and simply the perfect recipe for using up leftover cooked rice! 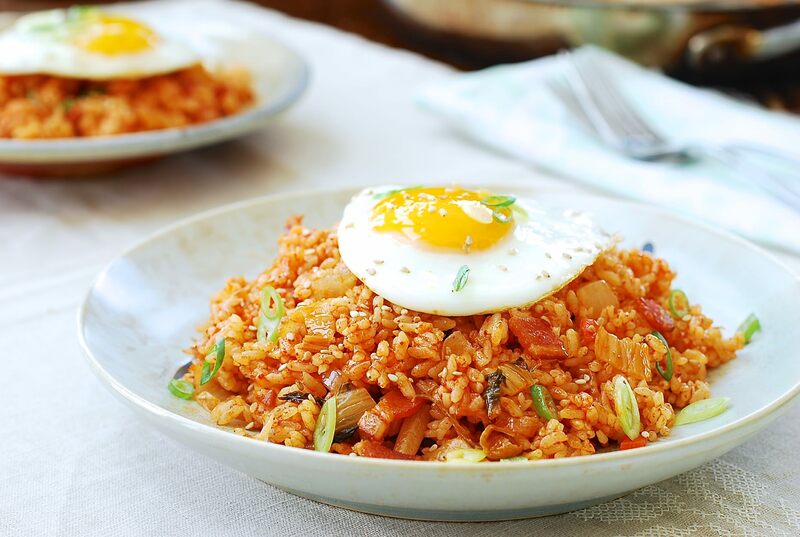 Serve this spicy and smoky Korean fried rice the traditional way – with a fried egg on top. I had been using up leftovers this whole weekend, so I decided to make this kimchi fried rice as a nice change from all of the Thanksgiving-inspired dishes we had been eating. Got leftover rice? Make Korean Kimchi Fried Rice! Kimchi fried rice is a humble Korean dish made basically with old kimchi and leftover rice. Since Korean homes almost always have these two staples, kimchi fried rice is a favorite go-to meal whenever there seems to be nothing to eat at home. This spicy and smoky Korean fried rice is especially popular among young people who are living on a low budget as it is a quick-fix meal – inexpensive to prepare, yet delicious and filling. This is probably why my son makes Kimchi Fried Rice quite frequently. If you like kimchi but have not had Kimchi Fried Rice, I highly encourage you to try and make it at home. I guarantee it will become one of your go-to easy dinners and a new family favourite. This time, I used a little bit of bacon – just enough to give the Korean Kimchi Fried Rice a smoky flavor. 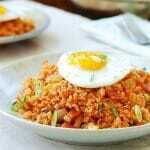 Serve this easy Korean rice dish with a fried egg on top if desired. As I mentioned in my previous kimchi recipe posts, when you cook with kimchi, it is best to use well-fermented kimchi for the rich and robust flavor it develops. No exception here. If you want to get even more flavor, add some meat – preferably fatty meat. Popular meat additions by Koreans include pork, bacon, beef, ham or spam. While stirring your Kimchi Fried Rice, scrape up the flavorful brown bits from the bottom of the pan – that’s where the flavour is! I like to add bacon to my Kimchi Fried rice, but If you are using fresh raw meat (I suggest about 4 oz), make sure to season it with salt and pepper and set it aside while preparing other ingredients. You can also add a small amount of garlic and/or ginger to flavor the meat. Coat the skillet with oil before cooking the meat. Some kimchi fried rice recipes use chicken or shrimp as the source of protein, so feel free to experiment once you’ve got a hang of the basic fried rice recipe. 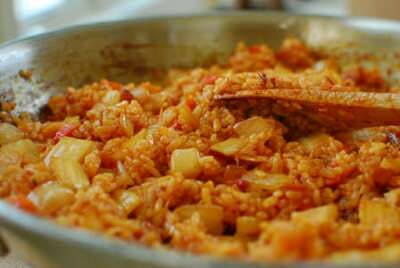 For a vegetarian kimchi fried rice, substitute tofu squares for the meat, use vegan kimchi and skip the egg. Which rice shall I use for making Korean Kimchi Fried Rice? Day old white short grain rice is the best. If the rice is hard after being in the fridge, heat it up in the microwave to soften it a little. If you need to make fresh rice for this dish, use a little less water than called for to make the rice slightly drier than usual. Cook the bacon until crispy, then add the veggies, the kimchi with its juice as well as some soy sauce and gochujang. Stir fry this mixture for 5 minutes, before adding the cooked rice. Stir constantly until everything is well incorporated and the rice clumps are all broken up. This should only take about 5 minutes. 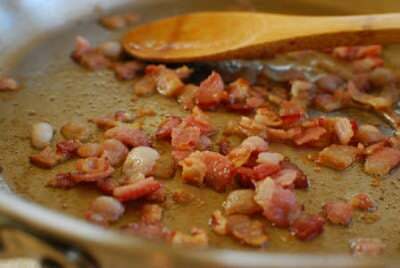 Add salt and pepper to taste and scrape up the flavorful brown bits from the pan while stirring. Mix in the sesame oil and the optional sesame seeds at the end. Top your Kimchi Fried Rice with the optional fried egg, and garnish with the optional sesame seeds and chopped scallions. Enjoy! Did you make and love this Kimchi Fried Rice recipe?Please rate the recipe below by either clicking the stars or with a comment! And make sure to share your creations by tagging me on Instagram! Stay in touch by following me on Pinterest, Twitter, Facebook, and Instagram. Kimchi Fried Rice ( bokkeumbap) is quick and cheap to make and is the perfect recipe for using up leftover cooked rice! 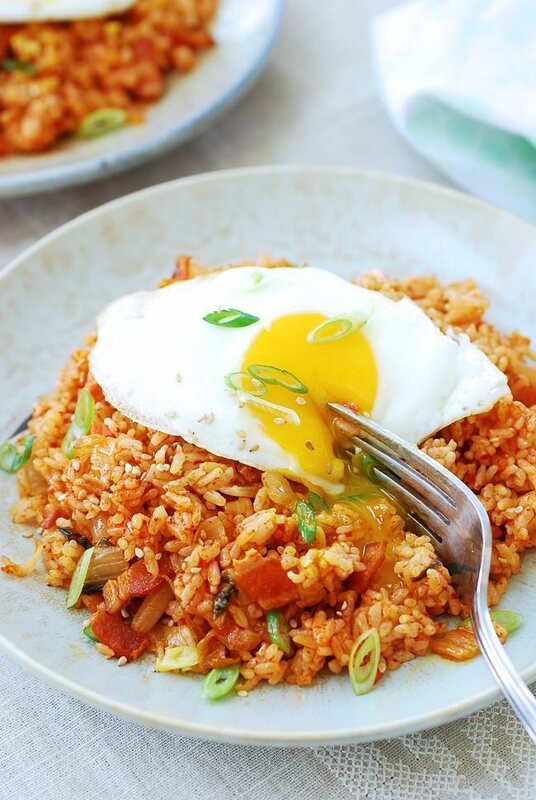 Serve this spicy and smoky Korean fried rice the traditional way - with a fried egg on top. Heat a lightly oiled large skillet over medium heat. Add the bacon pieces. Cook just until the bacon is slightly browned but not crisp. If you don't want all the rendered fat, remove the fat from the pan leaving about a tablespoon. Add the kimchi, onion, carrots, juice from kimchi, soy sauce and gochujang. Stir fry until the kimchi turns soft and deep in color, 5 - 6 minutes. Take the time to do this step so the rich flavors develop. Add the rice along with a tablespoon of oil, if you have removed the bacon fat. Stir constantly until everything is well incorporated and the clumped up rice is broken up, about 5 minutes. Add salt and pepper to taste. Scrape up the flavorful brown bits from the pan while stirring. Mix in the sesame oil and the optional sesame seeds at the end. 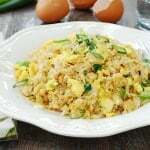 Top with the optional fried egg, and garnish with the optional sesame seeds and chopped scallion and serve. Believe it or not, I was craving this very dish today even though I’ve never had kimchi fried rice before. It just sounded so good, especially since kimchi has been on my mind a lot lately. I just had to come over as soon as I saw you post this on Foodbuzz. It didn’t disappoint. If anything, the craving is stronger than ever. Thanks Hyosun! So yes, I’m korean… but I have to admit I don’t LOVE kimchi. There are a couple that I like, like oi kimchi or ggak du gi, but the traditional one I have to be in the mood for… Unless it’s cooked in some form, then I love it! I do love kimchi fried rice very much 🙂 Yours looks delicious. 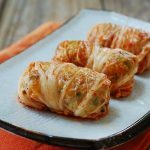 I love kimchi and usually have them around the house for the spicy kick that I need. Have made gyoza with it as well. awesome. This looks soooo good! Yum! I have actually made kimchi and bacon fried rice before (I often have kimchi in the fridge) and I LOVE it! My kids tell me kimchi “smells” and won’t eat it – what do they know???! I can even have just rice and kimchi for days and not get bored with it!! This is a new dish to me….sounds delicious! I adore kimichi…and we are always fans of fried rice. This looks just delicious. I wish I had a bowl to get me through the day before Christmas madness. Thank you for sharing this with me. I hope you have a wonderful and blessed holiday weekend. I’ve never had this — looks delicious! I love kimchi, but my husband won’t go near it. I grew up eating it as a kid. I’ll have to make this he next time I visit my mom! What is gochujang, by the way? 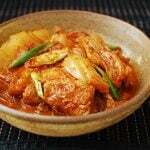 Melissa – You would like this dish if you like kimchi. Gochujang is fermented chili pepper paste. Thanks. I love bacon in fried rice and especially with kimchi. 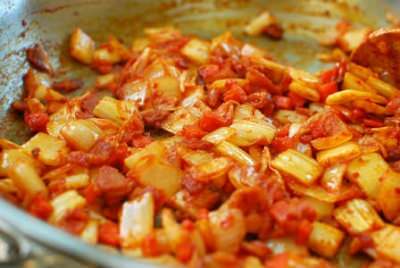 Sometimes I use bacon (or pancetta) in kimchi jigae just to get that smoky flavor. It may be too much for some people, but I love it. And I’ve never used gochujang or kimchi “juice” in my fried rice. I will have to give it a try next time. 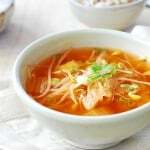 Amy – Gochujang and/or kimchi juice will add lots of flavor to the dish. Thanks for stopping by. Thanks for posting this recipe. I’ve been making kimchi fried rice for many years, but never had a concrete recipe. I also add egg to mine and instead of bacon, but husband is used to having SPAM. So far I’ve tried 3 of your recipes and they were all delicious. Thanks. Michelle – Thanks for trying out my recipe. I am so happy to hear you liked it. SPAM is pretty popular with kimchi dishes. Thank you for visiting. When uploading, I just pick “none” for a layout and “small” for image size. Then move them next to each other where I want the pictures to be. Hope this answers your question, but if not please let me know. oh.. i must try that. Love for food – Hope you give it a try. Thanks! 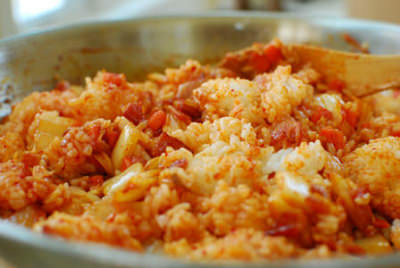 Hyosun Ro, I have just popped in to say I have made this kimchi rice and it was extraordinary! ( In fact I have already prepared it several times and loved it every time 😉 )Thank you for this wonderful recipe! I just bought a jar of kimchee over the weekend, can’t wait to try out this recipe. I’ve tried your kimchi fried rice (w/o gochujang) and just loved your recipe. I’ve reviewed most of your recipes and they also sound so delicious. 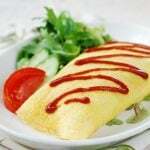 I just love Korean food and I can’t get it here where we live. I make my own kimchi as well. I will be trying out some of your other recipes soon if I can get to an Asian market for some of the other ingredients such as gochujang. Some Asian ingredients I can get but not the main ones that I want. Thank you for your recipes. Thank you! Look forward to hearing about your Korean cooking. Hi^^. Thank you for the delicious recipes. I love your recipes^^. I love this dish so much. I make it all the time (4 times now since I discovered the recipe last month). It’s so easy to make and I save money by making a big pan of it and eat it for dinner and lunch the following day. Sounds good, Maria! I love leftovers. I made this with cauliflower rice, it was delicious!! 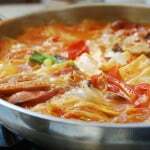 How long does it take for kimchi to get old? This was delicious! I threw in half a jalapeño that we had in the fridge for extra spiciness. Hello Hyosun. Thank you so much for sharing your recipes, they’re delicious. 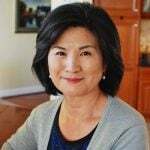 I’ve always wanted to learn more traditional Korean dishes, and now your blog is my go-to place for recipes. 🙂 I’ve used you kimchi jiage, kimchi spaghetti recipes — all delicious. Tonight I will try this kimchi fried rice. (I made a lot of kimchi a couple of weeks ago.) Thank you and keep sharing! Absolutely delicious! I will be making this many times, thank you for the recipe! 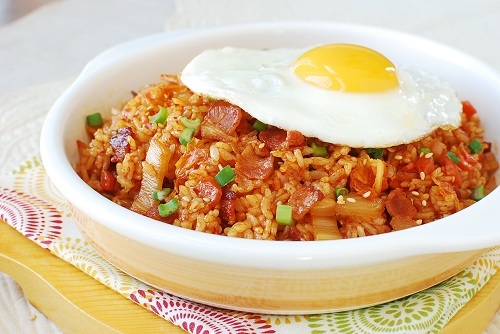 We love kimchi fried rice with cheese and fried eggs! This recipe is yummy. I didn’t have bacon the first 2 times I made it and I’m sure the bacon takes it up a notch. Will def try with bacon next time. We put shredded mozzarella on top and throw it in the oven for 10 minutes to get melty. Yummmmm. thank you! This recipe is a keeper! I made a couple of changes — tofu instead of bacon, used Sambal Olek (had in the fridge) instead of gochujang and brown rice instead of white. The results were delicious! I’m printing out your recipe and putting it in my recipe notebook because I’ll definitely make it again. Thank you for posting your recipe online! !